Renderings: Aerial Rapid Transit Technologies. 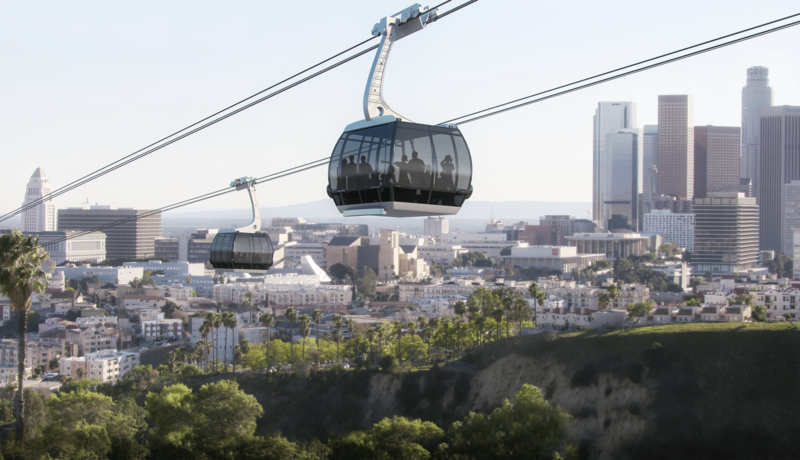 Metro announced on Thursday that it has signed a Letter of Intent with Aerial Rapid Transit Technologies LLC (ARTT), an action that formally begins the negotiations necessary to make a privately-funded aerial gondola to Dodgers Stadium a reality. The Letter of Intent signals Metro’s interest in implementing the project and moves it from the Unsolicited Proposals evaluation stage to project development. Metro and ARTT will now negotiate to reach agreements on roles and responsibilities for planning and constructing the gondola. Metro has run the popular Dodger Stadium Express free bus service from Union Station since 2010. A second route between Harbor Gateway Transit Center in the South Bay and the ballpark was added in 2015. A gondola and other options for improving access to Dodger Stadium were part of an informational study in 1990 by the Los Angeles County Transportation Commission, which later merged with the RTD to form Metro. The idea was never pursued until earlier this year when ARTT revived the concept and submitted an unsolicited proposal to Metro’s Office of Extraordinary Innovation. Actually, inherited from (at the time) ATSF, not UP. And LATL, formerly L.A. Railroad not P.E. Come on, even you acknowledged that this kind of routing would be a bad idea. He bout they are build sidewalks so u can walk there instead. Totally, a nice staircase would be even better. Walking next to a traffic sewer is no fun. Yeah, cause breathing carbon monoxide from the idled cars on the CA-110 into my asthmatic lungs is totally my idea of fun. What is there to negotiate? Metro shouldn’t fund constructing it. Metro shouldn’t fund operating it. Having rode the New York Roosevelt Island Tram and Palm Springs Aerial Tramway (the largest in the world) I think this has potential to be an iconic addition to Los Angeles. Maybe it will be path forward for meaningful public transit to hilly destinations and neighborhoods through the region as it was in the case of Medellin Metrocable. Don’t people still have air rights above their property? Unless this fiasco is only above the public right of way, streets, it seems to me it will be illegal. Sounds like a tourist attraction. Trolly cars would carry more people or maybe a monorail? Also, Elon Musk recently proposed to build a 3.6-mile underground tunnel to Dodger Stadium from a Metro station on Vermont Avenue! 5000 people per hour- so like, this will serve 5000 people on game days. Dodger stadium seats 50,000. It might have more capacity per hour than Elon Musk’s stupid tunnel though. This is a great idea, especially if they can work it into Union Station. Now in order to make it something to use all year, not just Dodger Stadium events, would be a nice overlook build to look over downtown , much the way people look over the city from the Griffith Observatory. Then maybe build a couple restaurants along the edge of the rim that can be used on game days and non- game days. Then work in some housing – as some people will pay for the views and maybe the sales of the housing will help offset some of the cost of the project. Also maybe a bike path from the top terminal out into Elysian Park to provide a bike connection from downtown to the park.